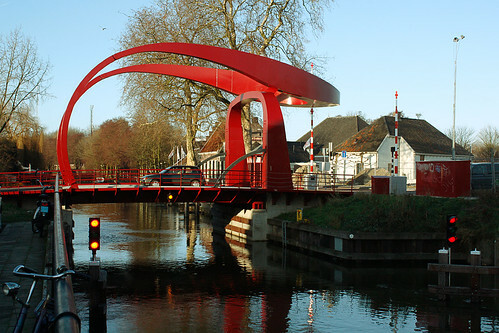 There is an unusual shaped red coloured bridge in Utrecht, the Netherlands. 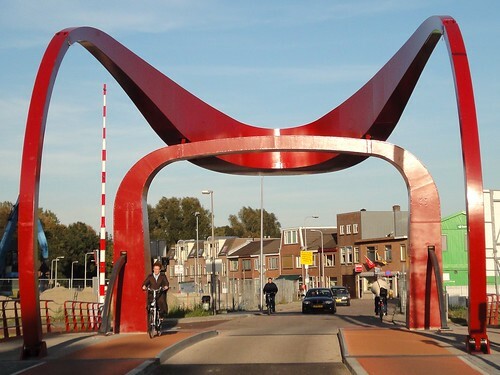 Known as the "Red Bridge" (Dutch: Rode Brug), it is a small narrow draw bridge on the water channel between Anton Geesinkstraat and the Loevenhoutsedijk. The bridge built in 2009 is replacement of an earlier bridge which was also red. A bridge had existed at this location as early as 1621. About 1870-1890 a double lift bridge was built here and in 1950s present bridge's predecessor, a single draw red bridge was built here. Because of its proximity to the Zandpad - Utrecht's red light district on houseboats, many feel that its red colour is symbolic of the activities in the area. The Zandpad area is also commonly referred as the Red Bridge. Credit: I am thankful to kite_surfer, Member and Master Cartographer, Google Earth Community, for checking the contents of this post. Thank you Kite. It would have been nicer to see how it looks when the bridge is lifted. It could in fact be an engineering feat as well as artistic one.